Today, I'm reviewing another book I read in 2015. And truth be told, this book is something I still love. So much. I told myself I wasn't going to write about this book because I didn't want to gather my thoughts about it. It was hard to gather everything I felt while reading this book into words but I couldn't not talk about it. So here it is, another magnificent work by the one and only Rainbow Rowell: Carry On. The characters and the world in Carry On was first introduced to readers in one of Rowell's other books, Fangirl. I talked about in my review from that book how I felt like I wanted to know more about this other world and how a Simon Snow world would be good to read about. Lo and behold, apparently, Rainbow Rowell was actually in the midst of cooking this new baby. Carry On is about Simon's last year in the academy he called home, Watford Academy of Magicks, and the adventures he had because he was chosen one. And just like what the synopsis this book had on its back-- it's a pure RR work, with kissing, hugs, friendship, and growing up, but with magic and dragons. I didn't fall in love right away with the book. It was the same way that Attachments felt dragging at first. But I got into it eventually and loved every bit of it. The world of Mages was fascinating and well-built, something that made me love this book. I found Rowell's take, or let's say this world's way of "using magic" as a refreshing and unique concept. The characters spoke to you as they narrated their stories. It isn't everyday that I feel this in books but Carry On was A++ in doing that. The supporting characters, too, were interesting. Everyone was involved and it's something that made the world of Mages, Watford, whole. This book was true to its young adult genre-- funny, easy to read, relatable but full of thoughts. This book didn't just keep me laughing, squealing, and screaming in my pillow. It kept me thinking. It kept me stuck to it. It dropped bomb after bomb in every chapter. But Carry On was a huge bomb. I asked for a copy of Carry On and read it without knowing what it will really be about. I didn't do any prior research except for its plot summary at the back. For short, I didn't have expectations. I wanted to read it and plunge into it. It surprised me-- its characters we're vibrant, and the story was spectacular, heartbreaking, and fluffy in different ways. Overall, Carry On was a fresh and unique read for me. 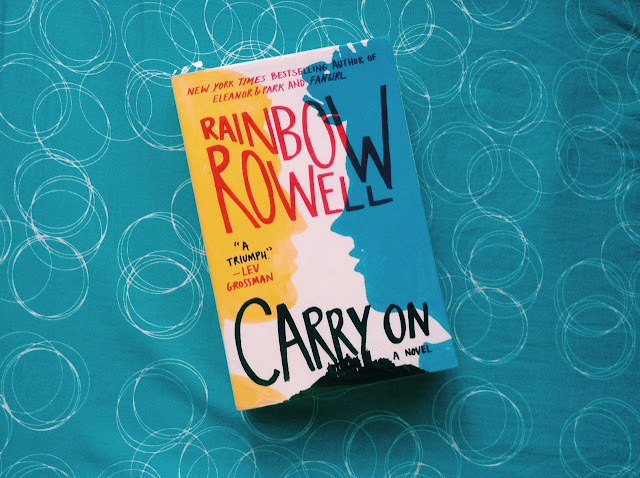 Another Rainbow Rowell read that introduced me not only to vibrant, beautiful and relatable characters but also to a wonderful magical world.